Governor and Lt. 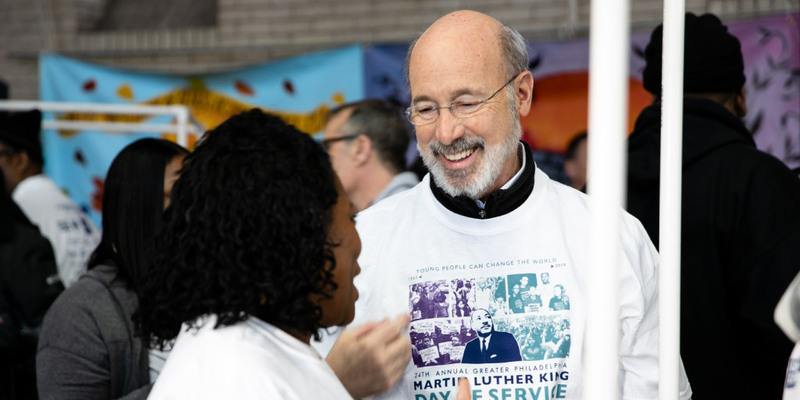 Governor Celebrate Legacy of Martin Luther King, Jr.
Harrisburg, PA – Governor Tom Wolf and Lieutenant Governor John Fetterman today celebrated the legacy of Martin Luther King, Jr. by participating in a day of service event and national bell ringing ceremony, both in Philadelphia. At the 24th Greater Philadelphia Martin Luther King Day of Service at Girard College, Gov. Wolf called for peaceful action toward an end to gun violence, moving forward to safer communities, taking care of each other, and following the example of Dr. King. “We simply cannot accept gun violence as a normal part of American life,” Gov. Wolf said. “And now, we simply cannot wait any longer to act. We need to stand together as Dr. King showed us, stronger than hate and united against violence. At the day of service, the governor and lieutenant governor participated in assembling “dream booths,” portable three-dimensional displays made of synthetic plastic pipe with panels of cloth with personal expressions of values and dreams of a world without gun violence called Dreamline Banners attached. At the Philadelphia Martin Luther King, Jr. Association for Nonviolence, Inc. annual bell ringing ceremony, Governor Wolf’s remarks focused on Martin Luther King Jr.’s legacy. “Dr. King’s example – his dedication to his community, to his incredible cause, and to his fellow man is truly awe-inspiring and I’m really pleased to play a small part in both preserving and moving forward his legacy,” Gov. Wolf said. Laura Wooten, a longtime election day volunteer, was the official bell ringer for the ceremony. The Philadelphia Martin Luther King, Jr. Association for Nonviolence, Inc. was founded by Honorable Dr. C. DeLores Tucker and a group of local leaders in 1983, 17 years after the assassination of the late Dr. Martin Luther King, Jr. The mission of the association is to preserve and advance the work of Dr. Martin Luther King, Jr. through educating, interpreting, advocating and promoting nonviolent theory and philosophy.